As I sit in our NYC hotel room tonight, I am overcome with the emotions of the day and of that fateful day ten years ago that changed the face of our country. On the morning of September 11, 2001, Luther and I had packed our bags preparing to grab a cab for our flight at the Newark Airport that morning. We had made our annual trek to NYC for the US Open Tennis tournament. I can vividly remember the sky that morning, a cloudless deep blue. The phone rang in our room. With the words,”Thank God you are still in your room. A small plane has hit the World Trade Center,” my dear friend Eleanor Foss delivered the news. We immediately turned on the TV and watched in horror as the second plane hit. Luther knew immediately that these plane crashes were no accidents. The unbelievable had happened; our country was under attack and we were caught right in the middle. Our first thought was to call Jordan to let him know we were safe. I tried my cell and then the house phone but all circuits were jammed. Eleanor’s call had somehow gotten through but getting a call out now was impossible. We knew we could not head to the airport. What were we to do? We had already checked out but were thankfully still in possession of a room. I continued to try to call Jordan, to try to call the office, to try to get the word out to anyone that we were alright. Finally, one call went through to our corporate office in Beattyville. Our staff had been in constant contact with Jordan and agreed to call him immediately to allay his fears for our safety. With contact made, we made our way down to the hotel lobby to get a feel for the situation. Total confusion greeted us as we entered the lobby. No one knew the full story of what was unfolding only blocks away. Keeping our room became our main concern. We knew we wouldn’t be flying anywhere that day and needed a place to stay. Someone, I don’t remember who, assured us that we could keep the same room. We knew no one would be checking in but others were wondering around with no place to stay. Luther and I walked out of the hotel onto Central Park South. Police cars, firetrucks, and ambulances were screaming by. The skies over the city were full of helicopters. F15 planes were flying low over Central Park! It was like a war zone and we were right there on the steets. Not that this was the worst situation we had faced but definitely one we were sharing with everyone walking the streets that day. We walked around the corner and looked south toward the World Trade Center location. We could see smoke bellowing. People were running. Others were walking as if in a daze. Although we had no thoughts of food, we found ourselves blocks away from the hotel close to our favorite restaurant, Trattoria Dell’ Arte. We wondered in the open door to an almost deserted restaurant. What we ate that morning is a lost memory but I clearly remember where we sat. As we ate at the same restaurant several nights ago, we commented on the table as we passed it and rememberd the waitress who had waited on us that morning. She had gotten caught on the subway on the way to work that morning as the towers were hit. Her tale of walking block after block not knowing what had happened gave us cold chills. As we came back to the hotel, Luther made his way over to the doorman and asked him how we could get out of the city. Talk on the street was that all the bridges were closed. There was a lockdown on Manhattan since no one knew the full extent of the terriorist attack. Danny, the doorman, said he would try to help us. He motioned to a driver who had just pulled up to the front of the hotel in his black sedan. It turns out that driver, Paul Seepersaud, had just dropped off a laptop and some papers for one of his clients at our hotel. Danny spoke to Paul about driving us back to the Cincinnati Airport where we had parked our car. As we were reminiscing with Paul this morning about that day ten years ago, he showed us the exact spot where he had been parked off of the Avenus of the Americas waiting for his client. Soon after 8:46 that morning as the first plane hit, Paul’s client came out of the building and told him to drop off her laptop and papers and told him to go home to his family. The rest is history of our close friendship with Paul. Paul told us today that he called his wife and told her of the doorman’s request to drive two guests back to Cincinnati. She asked him how he felt and he said OK so Paul agreed to try to get us out of the city. Luther and I grabbed our already packed luggage and jumped into Paul’s car. We had never met this man and here we were placing our lives in his hands. At this point, we would have done anything to get away from Manhattan. We just wanted to get to Jordan. Who knew at this point what other tragedies were to befall this city we had come to love. Our car was one of only a few private cars on Central Park South that morning. We asked Paul what time he thought we left that day ten years ago. As well as he could remember, we left about 10:15 or 10:30, close to the time the first tower fell. We flew on deserted streets toward the West Side Highway, Paul’s best guess for our escape. We actually headed toward the World Trade Center, not away as you would think. Finally, we made a u-turn and headed north on the West Side hoping to get across the George Washington Bridge. Although the radio had said the GW was closed, Paul still thought this was our best chance to get off the island. Paul was driving at breakneck speeds on a deserted highway with thousands of police cars and fire engines heading in the opposite direction. As we approached the bridge, Paul ignored the warnings that the bridge was closed. He kept driving. As we ramped onto the “closed” bridge, we saw thousands upon thousands of people running across the bridge fleeing the city on foot. As we crossed into New Jersey, we could see the smoke billowing from the World Trade Center site. I have no photos from that day because I had packed my camera away early that morning. In the panic to leave, I had not had the forethought to find my camera. We drove for over eleven hours that day, strangers when we left but friends for life at the end. Paul dropped us after midnight at a deserted Cincinnati Airport. We drove our car our out without paying the parking fees since absolutely no one was working. Paul promised us he would get some sleep before heading back to Long Island. We drove back to the safety of our peaceful eastern Kentucky home. Ten years have passed. My ties to 9/11 have deepened in ways unimaginable back on the day that changed the world forever. When researching families to include in my documentary, Space Between Breaths, my close friend Elaine Stillwell suggested I meet Tessie and Joe Hunter whose son, Joe, a NY City Firefighter had died 9/11. They lived on Long Island fairly close to Elaine and Joe and were Fellow Travelers. They had lost their daughter Margaret years before Joe was killed while responding to the World Trade Center tragedy. I approached Tessie about interviewing both she and her son Sean for our film. From our first conversation, I knew we would be friends for life. Her Irish lilt and compassion was intoxicating. Her unwaivering faith spoke volumes about who she was and how she and her husband Joe had raised their four children, Joe, Margaret, Teresa and Sean. Tessie and Sean Hunter graced my film with their open and honest sharing of their lives after losing their daughter and sister Margaret years before and then their son and brother Joe on 9/11. They came to Lexington, Kentucky, for the premiere of my documentary in May of 2007 along with eleven of the twelve families we interviewed for the film. Tessie and Sean are family. Joe and Margaret are family. I know Drew and Jeremiah know both Joe and Margaret. They are brothers and sisters. When the tenth anniversary of 9/11 was approaching, Luther and I discussed wanting to be in New York. We made plans to attend the US Open again as well as being at Ground Zero for the dedication ceremony. We wanted to be there to honor the memory of Joe Hunter along with the other almost three thousand other people who died on September 11, 2001. Tessie and Sean had entered a lottery to be chosen to read the names of the victims of 9/11 at the dedication ceremony. They invited us to join their family at Ground Zero to honor Joe. What an honor to be a part of Joe and Margaret’s family! Everything about our trip to NYC pales in comparison to the events of today. Tessie and Joe had been able to include us in their family group that would be admitted to Ground Zero for the dedication ceremony. Tessie had actually called the Mayor’s office to get passes for all of us. There are no words to express what it meant to both of us to be with Joe’s family today. Paul picked us up at the hotel at 6:30 AM We were scheduled to meet Tessie and the family at the corner of Murray Street and West Broadway at the Family Entrance checkpoint. Everyone had to enter together since Tessie had the family pass. The Hunter family was being driven in from Long Island by two of Joe’s best friends. We were to meet at 7AM and we didn’t want to be late. Paul let us off about three blocks from the Freedom Tower at 6:50 AM. Security was tightest I had ever seen in the city. Complete streets were blocked off with barriers lining the sidewalks. If a street was open, police cars had narrowed the lanes down to a single lane where each car could be carefully inspected. Areas around Times Square and Ground Zero were literally swarming with police. Recent terriorist threats around the 9/11 tenth anniversary had put everyone in the city on edge. Luther and I discussed not attending the dedication ceremony but have never let terriorism dictate our lives. We wanted to be there for Tessie, Joe and Sean so we made a decision to go no matter what. 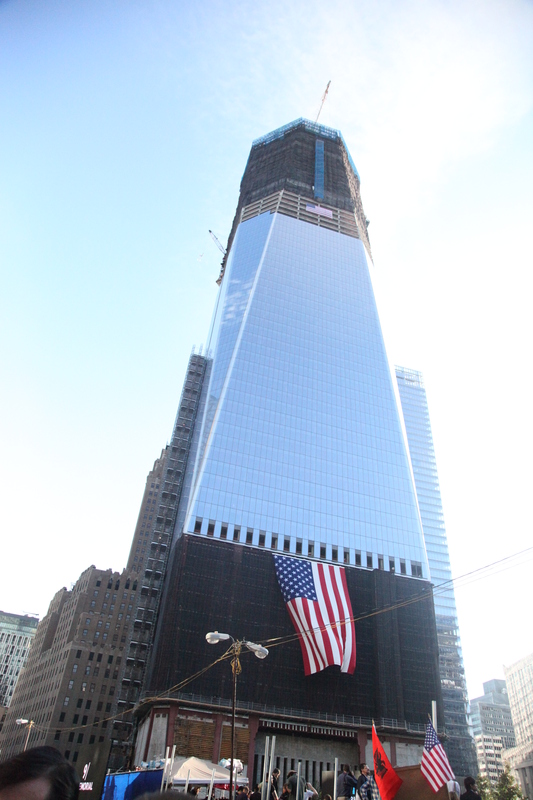 As we approached the first police barrier, we were only three blocks from the corner of the Freedom Tower. We could see it glimmering in the distance. Unfortunately, we did not have the necessary papers to be admitted at this west side checkpoint. When we told the policeman we were family members that were supposed to meet at the family entrance at Murray and West Broadway, we were directed to walk completely around the perimeter. We almost ran block after block so we would not be late to meet Joe’s family. We had to talk our way through police barrier after police barrier. Finally, as we could see the family entrance just beyond the last barrier, we were stopped for good. Official papers had to be produced to be allowed beyond this point at the corner of Murray and Church. Thankfully Sean Hunter called my cell just as we were politely trying to work our way past this last barrier. Joe’s family was only two blocks away from us and would send Tessie with the official papers to retrieve us. By this time, it was 7:30 AM. I had been taking photos of all the families as they made their way past us standing at the side of the police barrier. Some families had three members, others had as many as twenty. Many had t-shirts with pictures of their loved ones. People were handing out American flags. The one I was given will be a cherished possession of mine forever. My cell phone rang again and it was precious Tessie. She was at the family entrance and was looking for us. I finally spotted her and waved to her to let her know where we were standing. There was a wonderful policewoman who had been trying to help us gain entrance. She saw Tessis across the street and finally waved us through!! As we hugged Tessie, the realization of what we were about to experience became a reality. We were entering a sacred gathering of families who had lost loved ones on 9/11. One note, there had been a man dressed in a suit standing just inside the last police barrier who had been watching us all the time we were trying to find Tessie. He overheard our conversation about Tessie’s location and volunteered their location without being asked. Luther commented later tonight that he was an undercover Secret Service agent. Each officer was polite and respectful to each of the family members and other guests. After meeting up with Joe, Sean, Teresa, her husband Ron, their three children and Joe’s two best friends, we all went through the last police checkpoint. Our bags were carefully screened and we were finally free to make our way the last three blocks to the site of the ceremony. As we walked slowly with the throngs of other family members, there were volunteer staff members with orange STAFF hats, policemen, firemen, and Red Cross workers. Volunteers were handling out bottled water and folding chairs for the elderly. Even though Joe Hunter is in his mid-eighties, he would not take a chair. Like the rest of us, he ended up standing for the next five hours. He stood for his son Joe. Surrounded by the thousands of family members, guests and volunteers today brought the enormity of the 9/11 tragedy to light for me. Granted, we had been in NYC on 9/11 and we had become close friends with the Hunter family, but never, ever did we realize how many were affected by the loss of the almost three thousand people that day. There were families of every race, of every religion who came to Ground Zero today in honor of their loved ones. There were people in wheelchairs, men walking with canes and babies in strollers. Family members carried photos and wore remembrance shirts like Joe’s family. It was a virtual walking memorial wall. The dedication ceremony was a moving tribute to the victims of 9/11. Both President Obama and former President Bush gave moving remarks. Once, while Luther and I were standing listening as the names were called, a security guard asked us to move to allow those behind him to pass. Among the line of men following him was a rather short man that I remarked to Luther was either Mayor Bloomberg or Paul Simon. Turned out it was Paul Simon. His performance later in the ceremony was hauntingly beautiful. Names…all 2,976 of them were read one at a time by pairs of family members chosen by a lottery. Each pair read alternating names and ended with the name of their loved one with a brief tribute. My heart broke as young children bravely read the names of victims. When it came time to speak the name of the father many never remembered, their voices broke. One young man thanked his father for loving him enough to give him life. He said he never knew him since he was born after his death on 9/11. Wifes, mothers, fathers, brothers, sisters, aunts, uncles, cousins…all called out name after name. Each name had a story and a family who loved them. My heart broke with each name, especially that of Joseph Gerard Hunter. Although Tessie and Sean’s names had not been chosen to read names that morning, they were there watching and waiting for hours for his name to be called. I have a wonderful photo of Tessie and Joe at the exact moment they were reading their son Joe’s name. Their love for their son and each other is so amazing. We are honored to call them friends. After Joe’s name was read, we joined the throng of family members waiting to be admitted to the area of the park where Joe’s name rested in section 8 of the south memorial pool. It took us at least another hour to gain admittance to this area of the memorial site. Officers were letting small numbers of family members through at a time as others were leaving the site. There was no pushing. Everyone was respectful of the person standing shoulder to shoulder with them. Tessie and Sean found friends they had met through mutual suffering over the past ten years. Hugs and tears were a healing part of the day. My eyes were red-rimmed from the tears I shed over and over as we heard the stories of those chosen to read the names. The beauty of the park setting where the two memorial pools rest is beyond words. As we finally cleared the last police barrier, we walked past a line of at least fifteen police and firemen standing at attention lining the left side of the walkway leading to the memorial pools. I took a photo as we passed hoping to capture the poignant scene. NYC police and firemen are family. Seeing the support they gave to each of the families of their fallen comrades and the other victims made me proud to be an American. Lately, I haven’t felt proud to be an American very often. Today, I was proud to be an American and proud to be in New York. Joseph Gerard Hunter’s name is set beautifully into the bronze parapet surrounding the sunken spillway of the south memorial pool. Luther and I touched the water and then moved our fingers over Joe’s name leaving a wet imprint. We moved back to give other family members room. We were outsiders. Although we had suffered a great loss, our sons Drew and Jeremiah had not died at this sacred site. We stood and solemly watched as Tessie and Joe were able to finally see their son’s name. After a decade of battles over costs, designs, fund-raising, and how to order the names, this day was finally a reality. Tessie told us that the responder families had asked that the titles of their loved ones be included but the final decision was that each name would be stated without title. After hugs all around, we made our way out of the memorial site leaving Joe’s family still at the south memorial pool. We knew they needed their privacy. What a blessing they had included us in this memorial day. I am finishing this blog at 6:45 PM on Monday, September 12th. I will never be the same after July 23, 1992, our 9/11 but these past few days have been healing for me. As I look out tonight onto a beautiful Central Park, I am reminded that life does go on. Drew, Jeremiah, Joe and Margaret meant so much to those of us who loved them. Their lives will never be forgotten. Neither will those of the victims of the senseless act of 9/11. I pray for their souls and the families they left behind.